Organ, maybe the pivotal Finnish synth act, was the answer of Poko Records and Mikko Saarela to the futu (as the "futurist" synth pop was called in Finland) craze. 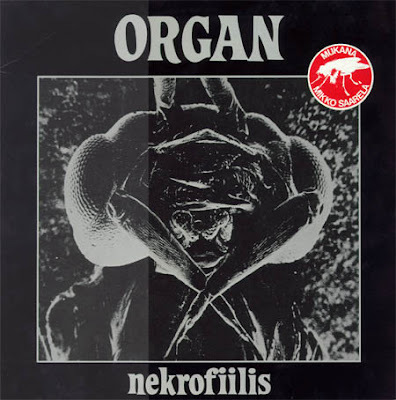 Organ was the outcome of the creative minds of Saarela (formerly of the popular Finnish punk band Eppu Normaali) and the synthetic Argon duo -- who had already released one album, Kone kertoo -- joined together. Organ's most famous song was 'Kärpästen juhla' ("The Feast of Flies") with its anti-war theme, mocking the clichés of some traditional Finnish patriotic hymns -- Mikko Saarela's witty, humorous lyrics held some social concern in them, dealing with the rights of test animals, helping the third world countries, bureaucracy and so on, in the best punk tradition. 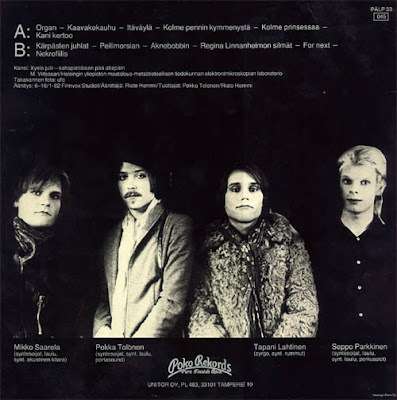 They released this album, Nekrofiilis (POKO PÄLP 33, 1982), and some singles; 'Kundi meikkaa' ("A Guy Makes Up") being the best known of them. Great synth/proto electro from Finland with teutonic beats and the ice cold feeling ,that characterised this period. Excellent! this blog has change my music expectation of internet, thanks for open my ears and imagination and i have a request Argon from the creators of organ. chidoo! Can you refresh the link to this album and C.K.C.-20h25?